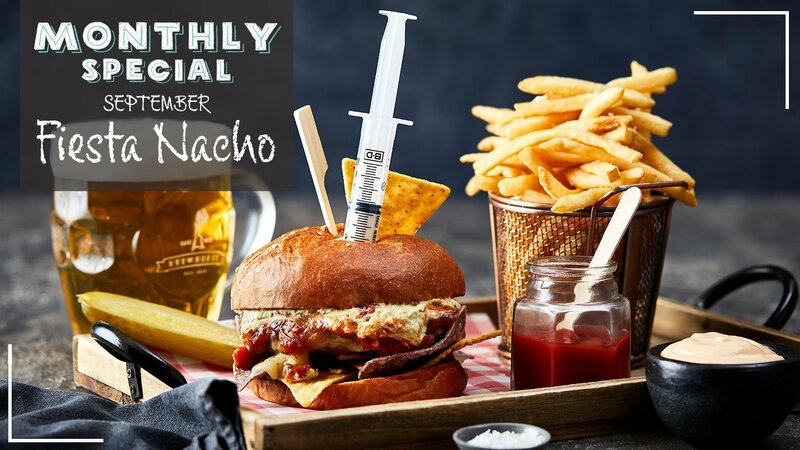 What do you get when you combine a nacho-style Cape Grim beef pattie with jalapenos, tomato salsa, corn chips, guacamole and mozzarella cheese with a sour cream-filled syringe? THE BEST MEXICAN BURGER YOU HAVE EVER TASTED! Our Basement Brewhouse Special of the Month for September is an explosion of all your favourite Mexican flavours, served on a brioche bun. Order the monthly special combo deal and get your Fiesta Nacho burger with shoe string fries and a pint of one of our Basement Brewhouse beers, all for just $25! The Fiesta Nacho burger is only available for the month of September, so head down to the Brewhouse before it’s too late!